Larry Williams had every reason to quit, but he brushed excuses aside and got unbelievably strong. With a training style that's pared down to the essentials, he's got the tools you need to rewrite the rules of what's possible! 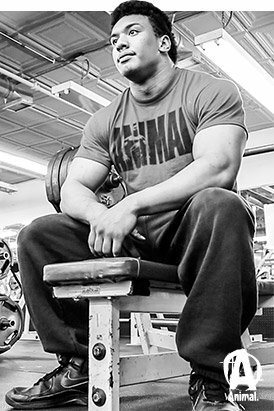 Meet Larry Williams, a 19-year-old powerlifter from the Bronx, New York. While he only has a couple of competitions under his belt, he's raising eyebrows around the strength world and is about to become an even bigger name, especially if we have anything to say about it. At his second ever powerlifting meet in July, Williams competed in the 275-pound weight class even though he weighed in at only 255. Despite this significant disadvantage, he won the class, totaling 1,965 raw (no wraps) with a 540-pound bench press, 700-pound squat, and 725-pound deadlift. He won his first meet at an even lighter body weight, also with a 1,900 total. If that doesn't blow your mind, go text it to any of your friends who know about powerlifting. They might not believe you. But this kid makes crazy lifts look easy. Most impressive of all, Williams is largely self-taught. He did nothing but Herschel Walker-style bodyweight training in his early teens, then "graduated" to cement and broomsticks. When an online video of Bodybuilding.com's in-house wunderkind Jesse Norris gave him a glimpse of what was possible for a teenager with proper training, Williams got serious. We can all learn from Williams. Stop making excuses and start making the most of what you've got, with this strength prodigy as your guide. Williams talks so calmly about his upbringing that he makes it sound downright normal. He spent time in foster homes, battled poverty and hunger, and laid his head down nightly in neighborhoods many people wouldn't feel comfortable taking a train through. In this setting, it's no surprise that his initial impetus toward strength training was for safety. He wanted to look strong enough that nobody would mess with him. "Williams's initial impetus toward strength training was for safety. He wanted to look strong enough that nobody would mess with him." In his early teens, Williams didn't have the money to join a gym. He did what he could, performing 200 push-ups, 50 pull-ups, and countless sit-ups every day. He would even challenge his mom to arm-wrestling competitions. Before long, she saw the writing on the wall and helped Williams build his own homemade weightlifting equipment using a basic broomstick and two concrete blocks that weighed around 40 pounds each. With a spot from a neighborhood friend, Williams would train with this makeshift equipment every day. He didn't follow proper form—if that term even has any bearing on such a setup. Once again, he just did what he could. "Because cinder blocks were so heavy, I'd have to swing the weight up," he recalls. "It wasn't pretty, but I did manage to do three sets of curls and military presses." Williams continued to get stronger this way, but he knew that, somewhere, there was a plate-loaded barbell with his name on it. At an age when many young men would rather play than work, he got a job so he could afford a gym membership. His training was still a cut-and-paste amalgam of his favorite YouTube videos, but his goal had become clearer: strength. Soon enough, he found he had it. To this day, Williams is largely a self-made athlete. Without a father or coach to help him with his training or his diet, he had to figure out everything on his own. After a couple of years of pushing himself against big iron, he realized strength like his was special. But one of the great things about the Internet is that it keeps egos from getting too big. You may think you're world-class, but a simple search will quickly show you someone better. "At one point I thought I was one of the strongest teenagers in the world, until I heard about Jesse Norris on YouTube," Williams recalls. "I saw what he was doing at a lighter bodyweight than me at the same age, and I was like, 'I've gotta get competing. I've gotta get these numbers up. I've gotta be relevant.'" Once competition became the goal, Williams got serious about optimizing his training, and avoiding the sorts of predictable mistakes most young trainees make—such as not leaving enough room for recovery. "One of the great things about the Internet is that it keeps egos from getting too big. You may think you're world-class, but a simple search will quickly show you someone better." "When I first started training, I lifted six days a week, thinking that more was better," he recalls. "This worked for a while but, at a certain point, I couldn't make any more gains. I couldn't get heavier than 190 pounds. Plus, I never make gains working out sore, and going more than a few days in a row leaves me sore every day. So I finally made the switch to three days a week, and I feel much more energetic throughout the week." Another unique customization you'll notice on Williams's training program below is two heavy squat workouts in a row. This wouldn't work for many people, but it's perfect for a man whose nickname is "Lottawheels." "I squat two workouts in a row because my legs heal very quickly," he explains. "Based on trial and error, I found that two times per week is the sweet spot for me. After this last squat workout of the week, I take two full days off so that I'm ready for deadlifts on Monday." Exercise Note: Alternate weekly between block pulls, sumo deadlifts, and conventional deadlifts. On block-pull day, work up to a heavy single. Exercise Note: Pause at the bottom of each rep. Exercise Note: Use light weight and focus on explosive movement. Exercise Note: Do not use leg wraps. Is Williams' program one that will craft you the bodybuilder's physique of your dreams? Don't count on it. 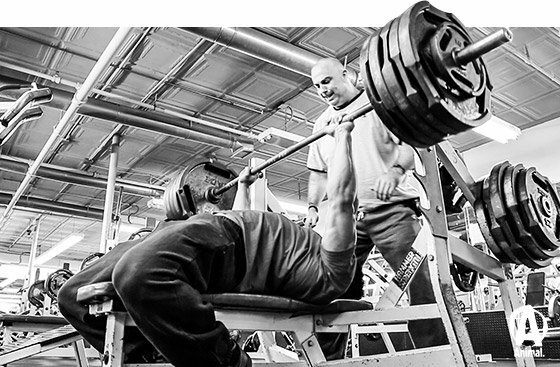 This is powerlifting, pure and simple, with no unnecessary work or distractions. But that makes it a perfect fit for a lifter like Larry, who considers what he does in the gym to be the template for his lean and mean lifestyle. 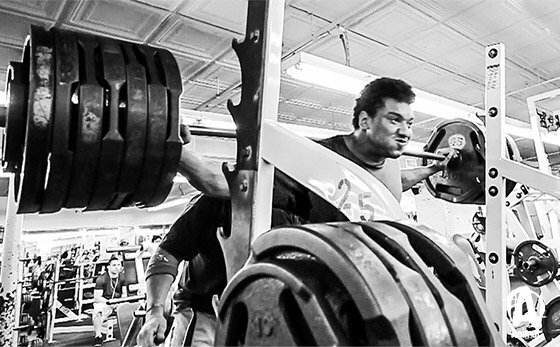 "Powerlifting for me has helped me be consistent and focused in life," he says. "With powerlifting, you need to be very consistent and particular about your technique." This ability to hone in on—and, just as importantly, be satisfied with—the essentials will serve him well in the military, which Williams says is his next stop. However, we're thrilled to report that he still plans to compete in powerlifting, and that he is also the newest member of the Team Animal family. This is a young man who knows how to do more than just survive. He's a beast in the making, and he knows he can serve as an example to other young men at the beginning of the journey. "I could be helpful to young guys—to really young guys—when they're going to ask me how I did it when I was 14 or 13 without any real money," he says. "They're going to be doubting themselves, and they're going to be unsure and uneasy, and they're going to be looking for an easy way out. I'll let them know how it is." It's time for Larry Williams to break through. Remember his name. You may have found yourself thinking one day, 'My whole life has been leading to this lift.' Strongman P Diesel knows this feeling far better than most. It took him 11 years of sweat, surgery, and rehab to make it to the Animal's Cage at the Arnold expo. What's better than an elite bodybuilder explaining his chest routine? How about two IFBB pros training together and discussing their pec-growth secrets! Jesse Norris is breaking world records at an age when other young men are just struggling to find their way. This 19-year-old is almost too strong.